This ancient papyrus from the 2nd century AD shows how delicate the material can be even without exposure to the destructive force of Vesuvius at Herculaneum. Photo: Public domain. Scientists in Italy continue – with new methods of modern digital technology – the virtual unwrapping and reading of the ancient papyri of Heraklion (Herculaneum) in Campania and, as they announced, made new progress in their very difficult work. The Herculaneum scrolls, many of which concern works by Greek philosophers, were discovered in 1752-54 in archaeological excavations in the so-called Villa of the Papyri in Heraklion (Ercolano in Italian) of Campania in Italy near Pompeii. The villa was destroyed and buried in the ashes after the devastating eruption of Vesuvius, the nearby volcano, in 79 AD. Today, approximately 1,800 papyruses are kept at the Institute of France in Paris and the National Archaeological Museum in Naples. Essentially this is the only ancient Greek-Roman library that has survived and which was in a small room of the Roman villa. They are the first papyri of Greek script that have been found in archaeological excavations. After Vesuvius’ eruption, a wave of hot air, which reached 320 degrees Celsius, burned the sensitive papyri and left them charred in a state too vulnerable for the researchers to try to open and read them without seriously risking destroying them. Up to now, archaeologists have attempted to open around 800, but often the project has had devastating or limited results. But scientists now have alternatives that are less destructive. The physicists at the Institute of Nanotechnology of the Italian National Research Council in Rome, headed by Alessia Cedola and Inna Bukreeva, have announced that – despite the use of appropriate algorithms – they have further improved the advanced X-ray Phase-Contrast Tomography (XPCT). 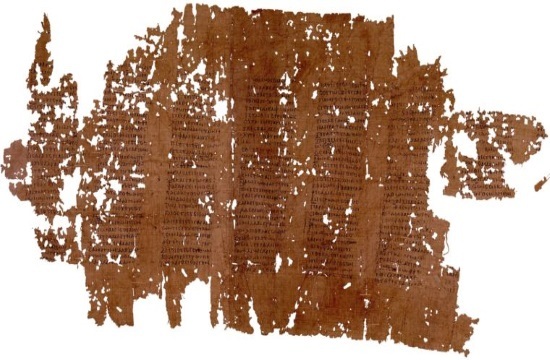 They were able to partially “unwrap” two papyri (PHerc 375 and PHerc 495) and begin to read literally their content. Creating initially at the European Synod in Grenoble a tomographic, three-dimensional reconstruction of each papyrus, they could then, with the help of the new specialized software, isolate one by one each successive layer, while on the path to read the letters on the burnt and distorted material. So far, they have identified 14 rows in Greek letters, more than ever before, some of which have already been read, while others have not. Two Italian papyrologists, who collaborate with the physicists to fully decode the text, believe that it is a work of the epic philosopher and poet Philodemos of the 1st century BC from Gadara. Scientists hope they will have completed their work by the end of 2017 and by 2018 they will begin digitizing other papyri. For the first time in 2015, other Italian scientists from the Institute of Microelectronics and Microsystems of the National Research Council in Naples, led by the natural Vito Mocella, had, with the help of the XPCT technique, read – without opening them – a small part of the content of half-damaged folded papyri. X-ray tomography separates the burnt substrate of papyrus from the letters with black ink, thanks to the subtle but distinct difference with which the two materials (papyrus and ink) refract X-rays. The letters are just 0.1 mm above the surface of the papyrus, but they can be read. Mocella, who had revealed the first words of the papyri, said the new research of his colleagues is “interesting work,” but he claimed that “it does not make significant progress” in relation to his own 2015 efforts and stated that his own research team has since made consistent progress. The eternal competition continues, but if they end up reading the papyri, it will be worth it. Material from ANA-MPA was used in this report by the National Herald.